Our co-host is Grit author Angela Duckworth, and we learn fascinating, Freakonomical facts from a parade of guests. For instance: what we all get wrong about Darwin; what an iPod has in common with the “hell ant”; and how a “memory athlete” memorizes a deck of cards. Mike Maughan is our real-time fact-checker. Listen and subscribe to our podcast at Apple Podcasts, Stitcher, or elsewhere. Below is an edited transcript of the episode. As you know, Freakonomics Radio is primarily an interview show, based on extensive research, in which we explore various issues, often quite complicated ones, in some depth. But we need a break from that now and again. Don’t you need a break from that now and again? Of course you do. And so, may we present the following episode of Freakonomics Radio Live — not recorded in some somber radio studio, but in a pub, in front of a live audience. It’s a little game show we like to play, called Tell Me Something I Don’t Know. It’s got the same D.N.A. as Freakonomics Radio, but in reverse. If you’d like to attend a future show or be on a future show, get tickets here. We’ll be in New York on March 8th and 9th, at City Winery; and in May, we’re coming to California: in San Francisco on May 16th at the Nourse Theater, in partnership with KQED; and in Los Angeles on May 18th at the Ace Hotel Theater, in partnership with KCRW. Stephen J. DUBNER: Good evening. I’m Stephen Dubner, and this is Freakonomics Radio Live. Tonight we’re at Joe’s Pub in New York City. And joining me as co-host is the University of Pennsylvania psychologist and author of Grit, our good friend, Angela Duckworth. Angela DUCKWORTH: Hi, Stephen. Hi, everyone. DUBNER: Hey, Angela. So happy to have you back. Angela, here’s what we know about you so far. We know that you are founder and C.E.O. of the Character Lab. DUBNER: That you are a MacArthur Genius Fellow who has advised the White House, the World Bank, N.F.L. teams, and more. DUCKWORTH: Previous White House, but yes. DUBNER: Previous White House. That was the — Truman? DUCKWORTH: After Truman, before Trump. DUBNER: Anyway, great to have you back on the show. Please tell us something we don’t yet know about you. DUCKWORTH: I was born in Cherry Hill, N.J., home to the very first real mall in America. DUBNER: Were you a mall kid? DUCKWORTH: I was a total mall kid. Every time I go to a mall with a food court, I feel like I’m home again. DUBNER: I have always had a theory — I’ve never been able to substantiate it — the secret to success in life is massive consumption of Orange Julius during teenage years. DUBNER: What did you do at the mall? DUCKWORTH: Wandered around and around and around until my parents picked me up. DUBNER: Because you had grit! DUCKWORTH: Maybe that was the seed of the idea. DUBNER: Angela, it is so nice to have you here to play Tell Me Something I Don’t Know. Here’s how it’s going to work: Guests will come onstage to tell us some interesting fact or idea, or maybe just a story. You and I can then ask them anything we want. And at the end of the show our live audience will pick a winner. The vote will be based on three simple criteria. No. 1, did the guest tell us something we truly did not know? No. 2, was it worth knowing? And No. 3, was it demonstrably true? To help with that demonstrably true part, would you please welcome our real-time fact checker, Mike Maughan. Mike is Head of Global Insights at Qualtrics, and he’s a co-founder of 5 for the Fight, a campaign to eradicate cancer. Mike, we know Qualtrics calls itself an “experience-management company” and that you’re always doing interesting research there. What have you learned lately? Mike MAUGHAN: So we’ve done a series of pain indexes looking at different industries and the experiences that people want. I think the most interesting one is a hotel pain index where we found that a third of guests who frequently stay at five-star hotels have cried because of a bad hotel experience. I think that probably says a lot more about the demanding, fragile, unresilient, non-gritty state of spoiled people than it does about anything else. DUBNER: All right, then, Mike, it is time to play Tell Me Something I Don’t Know. Would you please welcome our first guest, Colin Jerolmack. So Colin, I understand you are a professor of sociology and environmental studies at N.Y.U., which sounds like an interesting combination. I’m ready, as are Angela Duckworth and Mike Maughan. What do you know, sir, that’s worth knowing, that you think we don’t know. Colin JEROLMACK: I would like to ask you: what animal is most responsible for inspiring Darwin’s theory of evolution? JEROLMACK: Everybody thinks it’s the finches. And the thing is, the finches of course were — they have these different beaks. Some are short, some are long, some are curled, some are straight, depending on which island they were on, and they evolved these different beaks to be able to eat the seeds and the fruits that vary by islands. But Darwin didn’t figure that out when he was on the H.M.S. Beagle — he didn’t figure that out till decades later. He thought that these were different birds that were somehow related, but he didn’t think that they were the same species. DUBNER: So you’re here to tell us that Darwin wasn’t so bright. JEROLMACK: Well, it took him a couple decades to figure it out. DUCKWORTH: But there is an animal that did inspire him, right? DUCKWORTH: And it is not the big turtle-like things that are not turtles but they look like turtles? JEROLMACK: No we’ve gotten further away. DUBNER: Is it a fast animal? JEROLMACK: I would say medium. DUBNER: Is it a delicious animal? JEROLMACK: I’m vegan, so I’d say no. DUCKWORTH: Is it a bigger-than-a-breadbox animal? DUCKWORTH: Smaller than a breadbox. DUBNER: Is it a breadbox? DUBNER: Alright, tell us what the animal is. JEROLMACK: The pigeon. The humble, lowly rock pigeon that we see outside this very studio. So, Darwin kept pigeons for 12 years or more, and he was fascinated by them, because you could breed them. And there were so many different breeds. In Victorian England there was hundreds of different breeds of pigeons. But the idea at the time was that all these different breeds came from multiple species. So he bred them and wanted to figure out how plastic they were, and over generations he discovered that if you mix them all together, you get the same pigeon that was walking around on the street. He thought these must have all come from the same species, not multiple species. If some of you may remember, if you actually read The Origin of Species, this is why he spends the first 70-plus pages on pigeons. And he gently guides you through all the variation, all the different breeds, how tall you can make them, how fat or small you can make them. And then he hits you with the bombshell and he says, “If I can do this breeding pigeons in just a couple of years, imagine what Mother Nature could do over millions or hundreds of millions of years.” And he says Mother Nature is the selecting hand, right? So first he says, “I’m the artificial hand of breeding,” but Mother Nature is the selecting hand. DUCKWORTH: So why is this amazing fact so unknown? Like, what — finches are just too — they’re sexier than pigeons? JEROLMACK: I think the real answer to your question is that nobody’s actually read The Origin of Species. DUCKWORTH: I think that’s probably the answer. DUBNER: So can you tell us more about how popular pigeons were in Darwin’s day, and to what end? They were used in obviously messengering, but were they used in warfare, and all this kind of stuff? JEROLMACK: That’s what he said. Just get rid of speculative stuff about evolution, and if you make this just about pigeons, it will be a coffee table book. Everybody in England will buy it and it will be a bestseller. DUBNER: So what you’re really here to tell us is that the publishing industry is exactly the same today as it was then. JEROLMACK: It hasn’t changed much. That’s right. DUBNER: When was peak pigeon? JEROLMACK: Probably around that time, late 1800’s, early 1900’s. So what happened after that is, we used to actually love pigeon crap. We domesticated pigeons 5,000 years ago because their feces was such valuable fertilizer. And then we also realized you can eat them — so squab, if you’ve ever eaten squab, that’s pigeon. DUCKWORTH: Oh, that’s pigeon. God! JEROLMACK: And then, as Stephen alluded to, they served as messengers. Genghis Khan sent pigeons throughout his empire to send messages. Also, Reuters was launched on the back of pigeons, on messenger pigeons. But then after the turn of the century, nitrogen fertilizer replaced pigeon feces, chickens replaced pigeons, you could breed them much fatter, much quicker. And obviously we don’t need them for messages anymore, either. So they’ve kind of become, from society’s terms, useless. DUBNER: If they can do all that stuff — carry messages by having a homing instinct, if nothing else — are we to assume that they’re relatively smart, especially for birds? JEROLMACK: Yeah, they’re not bird-brained. You’d be surprised. Pigeons pass the mirror test. There’s very few animals that pass the mirror test. DUCKWORTH: What’s the mirror test? JEROLMACK: Looking at oneself in a mirror and understanding that they’re looking at themselves. DUCKWORTH: So walk me through — a pigeon is in front of a mirror. How do you know that the pigeon knows that it is itself? DUCKWORTH: To get the red dot off of its mirrored image. JEROLMACK: Yeah. I could tell you some other things that make them rather intelligent. So they can be trained to tell the difference not only between cubist and impressionist paintings, but between a Monet and a Picasso, or if you’re giving them some other Cubist or Impressionist painting, but that is not a Monet or a Picasso. DUBNER: So, would you call yourself a pigeon advocate? JEROLMACK: Yes. They got me tenure. DUBNER: Alright. So I don’t expect an honest answer from you on the following question, but: how do you know that the pigeon is actually so smart — as opposed to being the bird that was popular and therefore was trained a lot? Could I take a seagull, could I take a dove, etc.? DUBNER: Train it to carry messages. JEROLMACK: Oh gosh, no. Come on. Are you serious? No way. DUCKWORTH: Wait, a dove? Isn’t a dove — it’s like a pigeon. JEROLMACK: So, I’m glad you brought that up, because this actually gets the Stephen’s question about the bad rap that pigeons have. DUBNER: So a dove is all peace and purity, and a pigeon is a garbage eater. JEROLMACK: That’s right. And there’s many languages that don’t even have a different word for pigeon and dove, and a lot of — if you’ve ever gone to a wedding or to the Olympics and they release doves, these are white homing pigeons that will leave and fly away and go back to the owner who’s bred them and trained them to fly. I argue that a lot of religious iconography of Jesus as the spirit descending — Jesus could have been a pigeon. We don’t actually know whether that was a pigeon or a dove. DUBNER: Mike Maughan, fire up your Google. We’re going to need to know if Jesus was indeed a pigeon. Let me ask you this: Why are they the one bird that I know of at least that walk among us in cities? JEROLMACK: Yes. So first of all, in terms of literally walking, they’re ground feeders. That’s why they walk and they don’t hop — birds that hop mean they feed in bushes or flowers or trees. Pigeons are ground feeders. So pigeons were the first bird to be domesticated, over 5,000 years ago. And as I mentioned, we domesticated them for agriculture, for the fertilizer, and to eat them. But they’ve actually co-evolved with humans — when we moved to cities, we brought pigeons with us. They, at this point, have been living in cities since cities were around. Today, unfortunately with climate change and urbanization, species basically have two routes: they go extinct or they survive, and the survival route usually means adapting to living amongst people and actually changing your evolutionary trajectory, and pigeons have done that. They are generalist eaters, so they — we leave a lot of garbage around, tons of garbage around for them to eat, and they can pretty much eat almost all of it. And we feed them as well, and because their natural habitat is actually cliffs and rocky ledges, even in terms of walking amongst us — I like to call them pedestrian animals — they literally walk on the sidewalks and sit on benches and ledges because they prefer them to grass, shrubs, or trees. It’s more like their native habitat. DUBNER: Has anyone ever seen a baby pigeon? DUCKWORTH: Yes, I have. I saw one growing up on a window ledge in a hotel a few months ago. Why do you ask that question? DUBNER: Because I’ve never seen a baby pigeon. Tell us a little bit about pigeon family life. Do they — are they monogamous-ish? Honestly here’s what I thought, when I first moved to New York years ago: I would see pigeons all over, but never babies or even adolescents. But I somehow imagined that pigeons would be a couple. I don’t know if they are. And they would — when they were with child, they would go to the ‘burbs and have the kids there and then the adults would come back when they wanted to go to the theater. DUCKWORTH: Send them to good schools, and they can ride their bikes. JEROLMACK: That’s an interesting hypothesis. You’re not entirely wrong in terms of they actually do what I think at least many humans aspire to: they mate for life and they’re monogamous. And they’re also pretty good on gender equality. They both sit on the eggs, and they both feed the young. If you’ve ever seen pigeons that appear to be kissing, the male is actually throwing up into the female’s mouth to demonstrate that he can produce the crop milk to feed the babies. JEROLMACK: That seals the deal. She’s like, oh yeah. DUBNER: But what about from birth to adulthood? Where are — why don’t we see the young? JEROLMACK: It’s kind of hilarious if you get to see it. The mother and the father will sit on the baby until it’s fully grown. So they don’t fledge the nest. DUBNER: They are like people, actually. JEROLMACK: Yeah, they don’t fledge until they have gone to college and come back home. I’ll give you a tip if you would really like to find baby pigeons: any time you’re walking pretty much anywhere, but say particularly under an awning, listen for these really high-pitched squeaks, and that’s a baby pigeon. And if you listen and look around, you’ll find them. DUCKWORTH: He’s a tenured professor at N.Y.U. He’s like a professor of pigeons. DUBNER: And also, he’s got khakis and a braided belt, and I there’s something about that that just says verity. JEROLMACK: I got to thank my wife for that. DUBNER: So I find no reason to distrust anything he said. But you’re the man with the Google over there. MAUGHAN: So, a few things — you don’t have your wife to thank for a braided belt. You should be mad at her. No. 2, you said that pigeons were like humans because they’re monogamous and mate for life. That’s not true. Humans don’t do that. JEROLMACK: Oh I see. I said humans aspire to that. MAUGHAN: Next, you and Angela were debating which animals are the sexiest. Just a quick warning: don’t Google that on your work computer. So a few things. It’s not very helpful, but a publication called City Lab New York City said that this city is believed to have between 1 and 7 million pigeons. Really great range there, so thank you. It’s interesting to know that in the past 20 years in China, there’s been an amazing boom in young money, and this self-made billionaire crowd has chosen pigeon racing as their sport of choice. The most expensive champion racing pigeon sold for almost half a million dollars. Lastly, I just want to say you all know Crocs, the little rubber shoe. So I think it’s important to recognize that pigeons are a lot like Crocs, they’re more functional than they appear, but still super weird to have with you in any situation. DUBNER: Thank you, Mike, and thank you Colin Jerolmack. Would you please welcome our next guest, Ben Orlin. Hi there, Ben. It says here that you are a math teacher and author of the new book, Math With Bad Drawings, so I’ll assume you’ve got something a little math-y to tell us tonight. The floor is yours. Ben ORLIN: Yeah, that’s right. My question for you is: who’s likeliest to buy lottery tickets? MAUGHAN: Stephen, how do you really feel? DUCKWORTH: I think the lotteries are evil. Don’t they prey upon people’s lack of numeracy, effectively, right? DUCKWORTH: Yeah, do it. Go for it. DUBNER: —is that if you play the slots, what’s the rake on a slot machine? You’re a math guy. ORLIN: Yeah, I think it’s in that range. DUBNER: A parimutuel — you go to a horse track, the track is maybe taking 12, 14 percent. ORLIN: Yeah, maybe closer to 20, but yeah, in that range. DUBNER: But the state — what’s the average for state lotteries? ORLIN: Close to 50 percent — 40 percent or so. ORLIN: Yes, so I’m a math teacher, so it’s not my place to decide how the state should cheat people out of their money. But who are they cheating out of their money? It turns out, actually, so the state where the most lottery tickets are bought is Massachusetts, my home state — a lot of very educated, wealthy people in Massachusetts. And it turns out, Gallup did a poll, 2016, so not that long ago, and people making more than $90,000 a year are actually likelier to buy lottery tickets than people making below $36,000 a year. DUBNER: Do we call 90 and above high income, or we call that middle-high? What do you want to call that? ORLIN: I’m impressed, I think 90 is pretty good. DUBNER: You are a math teacher. But you would call 36 pretty good too as a math teacher, would you not? ORLIN: 36 is below national median. ORLIN: Yeah, that’s right, people who are higher income are actually likelier to play than people who are low income, and similarly, people with bachelor’s degrees are actually likelier to play the lottery than people with no college education. DUBNER: So you’re saying that this general idea that the lottery is disproportionately popular among lower income is not quite right. DUCKWORTH: So how many lottery tickets are they buying? ORLIN: Yeah, that’s a good question. So Gallup doesn’t have data on that. In the same sense also that if someone making $36,000 a year buys a lottery ticket, and someone making $100,000 a year buys a lottery ticket, the person making less has just spent a much larger percentage of their income on lottery tickets. So even if they’re buying the same number, we can still call it a regressive tax. DUCKWORTH: So wait, let me just make sure I understand. You’re saying that people who make a lot of money buy more tickets per person on average. ORLIN: They’re more likely to participate, yes. Per person, I’m not sure. But more likely to buy a ticket, at least. DUCKWORTH: More likely to buy a ticket. DUBNER: And what share is that? Let’s say 90 and above. Are we talking 30, 60 percent? Where are we? ORLIN: It is basically about 50 percent, across pretty much every income group. ORLIN: So yeah, we’re looking at 46 percent or so. So it’s not a huge difference. When it comes down to it, about half of people play the lottery. DUCKWORTH: That itself is — half of people play the lottery? DUBNER: But play the lottery means what, one ticket in the past 12 months? ORLIN: Yeah, it’s played in the last year. Although, if you look at Massachusetts, that’s the state where we have sort of the highest spending, it’s about $800 per person per year. So the average person is buying two lottery tickets a day — that’s probably not evenly distributed. I don’t think — I mean I don’t know, unless my wife has been sneaking off and buying way more lottery tickets than I think. ORLIN: So the total amount spent, if you divide by the number of people in Massachusetts, you get $800 per year. Yeah. DUBNER: So let me ask you this. Let’s just pretend that Angela and I have decided that we think playing the lottery is a bad idea. DUBNER: Let’s just pretend that. But then, let me introduce — let me just say well, let’s say the expected value is very low, relative to what I can do with a dollar, $10, elsewhere. But what about the entertainment utility? Has anyone ever measured that? Do we have any idea? ORLIN: I mean, the measure of entertainment utility is that people keep doing it and they seem to do it very gladly and in great quantity. DUCKWORTH: It could be — people could be buying tickets because it’s fun, or they could be buying tickets because they are legit thinking that they are going to win the lottery and that they’re gonna be lucky. DUBNER: Let’s say this, Mr. Math Teacher. Let’s say that Angela I change our mind. We think, “Hey, we’re going to play the lottery because we think we can win because we know a smart guy named Ben Orlin, who’s a math teacher who’s interested in the lottery, and he can help us not cheat, but cheat.” So what are some things that we could do to increase our chances of winning? For instance, I’ve read that — let’s say you have a pick of numbers that go from zero to 100, that if you pick numbers above 31, let’s say, that at least if you do win, that you’ll have a bigger payout because so many people play their birthdates, for instance. Does that work? ORLIN: Yeah, this is true. So there are certain numbers, numbers that show up on fortune cookies, or numbers that are birthdates. It’s not a good idea to pick those. Because if you win on that number, you’re going to be sharing with all the other people who had that fortune cookie. Stephen, you mentioned expected value, which I think — someone who’s taken a probability class or a math class, I think the assumption is, expected value is sort of what you should be looking at. So right now, for example, the Mega Millions just went up to the highest it’s ever been, $1.6 billion right now. Expected value is basically just the long run average — if you are to buy tons and tons and tons of tickets, how much would the average one be worth? So for Mega Millions, there’s only about 300 million possible tickets. It’s worth $1.6 billion. So the average ticket should be worth more than $5, and they only cost $2. So in theory, it sounds like a good idea. The problem is, if you go out and buy a ticket you’re going to just lose your $2. DUCKWORTH: Why don’t you just buy every possible combination? ORLIN: Right. So this is very hard to do with Mega Millions. It’s actually happened in 1993, the early days of state lotteries. Virginia — the prize went up all the way to $28 million because no one had won it for a while. There were only 7 million tickets for $1 each. There was actually a syndicate, a group of people in Australia, who said, “Okay, we’ll just buy them all, that’s the easy money right there.” Which sounds like easy money but it’s not that easy to go and buy seven million lottery tickets. DUCKWORTH: Oh that’s right, because you have to go to so many delis. ORLIN: So what they did — this team in 1993 placed a lot of big orders with grocery store chains and convenience store chains. But even that didn’t work out that well for them — there’s actually one chain that had to return $600,000 to them for tickets they weren’t able to print. By the time of the drawing, 7 million tickets out there, they had actually purchased 5 million of them. So there was a two-in-seven chance they were going to wind up losing all that money. DUCKWORTH: Okay, well then what happened? ORLIN: What happened was, two weeks went by, and the state knew that they’d sold the winning ticket, but no one could find it, because they had 5 million tickets they needed to look through. And then about two weeks later they surfaced and they did win the money. The state lottery commissioner was furious and issued this sort of — like a villain at the end of a heist movie as though he knew he’d been beat but he swore he would never get beat that way again. And actually since then it’s become much harder to do those kind of bulk purchases. Most states have passed laws against that. And if you wanted to try it on Mega Millions right now — if you could do it it’d be great to get all 300 million tickets, but there’s just no feasible way to do it. DUBNER: Mike Maughan, Ben Orlin is telling us that pretty much a lot of people love to play the lottery, and it’s not what we expect in terms of income. What more can you tell us about that? MAUGHAN: So, here are a few things that are more likely to happen to you than winning the lottery: giving birth to identical quadruplets. Getting killed by a falling coconut or having a vending machine fall on you. And the kicker, you’re more likely to be elected president of the United States. But we’ve already shown that anyone can do that. DUBNER: Thank you, Mike, and Ben Orlin, thank you for playing. Would you please welcome to the stage Kate Sicchio. Kate is an assistant professor of dance and kinetic imaging at Virginia Commonwealth University. Kate, why don’t you tell us something we don’t know please. Kate SICCHIO: Sure. I can tell someone’s emotional state when they’re using their smartphone just by looking at them without seeing what’s on their screen or what they’re reading. How? DUBNER: By how hard they’re weeping? DUCKWORTH: Without looking at their face, and without seeing what’s on their phone? DUCKWORTH: From their body posture, is it from that? DUBNER: Does this have to do with what you do professionally? DUBNER: You are a professor of dance and kinetic imaging — what is kinetic imaging? We’ll start there. DUBNER: So you observe their movements, and because you’re a dance professor you can tell how they’re feeling? SICCHIO: So in choreography, we have different tools of analysis. And in particular there’s this thing called the Laban Effort Graph. And what it does is, it allows you to look at movement in three different categories. One is time: is the movement sudden or sustained? One is space: is the movement direct or indirect? And another is force: is it strong or light? And when you combine these three things you start to get gestures — so a strong, sudden, direct movement is a punch. Right? SICCHIO: I know you’re angry. DUBNER: I wouldn’t have figured that out without my kinetic imaging degree. DUCKWORTH: But that’s the thing. Like with the phone, I mean, how much range is there when people are on their phone? SICCHIO: Right. So one of the things we do a lot on our phone is, we do things like mindless surfing. Well, that gesture is what we call a flick. So it’s indirect and light and sudden, right? And that means that yeah, you’re not really being conscientious, you’re not paying that much attention, you might be bored. DUCKWORTH: So what does sadness look like on an iPhone, in terms of my using it? SICCHIO: Usually sadness is like, light, but it’s usually more sustained. Right? And it’s usually indirect. DUCKWORTH: So not quite a flick. SICCHIO: Right. Not quite a flick. One of my favorite ones is Tinder. So when we’re using Tinder, we’re doing this really careless gesture. And of course that’s where you meet people to hook up, not someone you’re going to care about in the future. DUBNER: So do that gesture again, because that’s good for radio. And give me something that’s the opposite of that. DUBNER: That sounds not that unlike Tinder to me. SICCHIO: But to book your hotel you have to do a very direct, sustained movement. It’s much more of a commitment to get your hotel room than to find a date. You have to actually trace the shape of a bed on the phone. So it’s this really direct movement that you have to do in order to purchase. DUBNER: Are there practical applications of this observation? SICCHIO: Yeah, I think that you could make things more direct and more sustained so people would think about it more. Maybe we want news apps to be more like that, so people are actually careful about what they’re reading and thinking about what they’re digesting in terms of the content. DUBNER: Mike Maughan, Kate Sicchio is saying that you can tell how people are feeling by looking at how they interact with their phones — true? MAUGHAN: Yes. So we hear that Tinder is this hookup app, right, because it takes so little effort, and you’re just swiping left and right. Now, that may be true at the beginning of a relationship, but it doesn’t tell us a ton about what it takes to get into a relationship. Because by the time people are able to actually meet and hookup, they will have had to have engaged in some more committed behavior like texting, phone calls, et cetera. What appears is that it’s not necessarily the results of how much effort someone takes throughout the time to get together, physical or otherwise, but rather it’s how the relationship starts. Something that may indicate what that means for us, The Atlantic has reported that couples who cohabitate before marriage tend to be less satisfied and are more likely to divorce. So the issue with Tinder may not be the human movement overall, but rather what the human movement says about the desire for commitment from the very beginning of the relationship. DUBNER: Angela, does that make sense to you? DUCKWORTH: I mean I think that when you say that people who live — maybe I’m taking this personally. But anyway, why would someone who lives together with another person be more likely to — is it divorce, is that the fact? MAUGHAN: Yes. As a certified non-marriage counselor — I think the idea is that if things start out without a deep level of commitment, then the research shows that we’re less likely to stick to it. You’re the person that studies grit, passion, and perseverance, so I’m not going to fact check you on whether people stick with things or not. DUBNER: Let’s do this half of the room. DUCKWORTH: Right. And then we’ll know. MAUGHAN: Speaking of spurious correlation, though, I do think it’s important to note that the number of people who die becoming tangled in bedsheets almost perfectly correlates with per capita cheese consumption. DUBNER: Mike, thank you so much for that, and Kate, thank you for playing Tell Me Something I Don’t Know. DUBNER: Before we get back to the game, we have got some FREAK-quently asked questions for Angela Duckworth. You ready to go? DUCKWORTH: I’m ready to go. DUBNER: You are best known for having written the book Grit. The Philadelphia Flyers of the National Hockey League have a new mascot called Gritty. Was that your doing? DUCKWORTH: Okay, that was 100 percent not my idea. It’s awful. Have you seen it? DUBNER: It’s like an orange alien. DUCKWORTH: No, I had nothing to do with it. DUBNER: Do you know if the people who invented and named Gritty are fans of yours? DUCKWORTH: I do not. They have not been in touch. DUBNER: Do you think it’s a dereliction-of-royalty issue for which they have not been in touch? DUCKWORTH: I am not suing the Philadelphia Flyers for their use of the word gritty because I don’t think I — can you own a word? I don’t think you can own a word, can you? Do you own Freakonomics? DUBNER: I do own Freakonomics. Angela, I know you’re working on a new podcast about the work of the Character Lab, which advances the science and practice of character development. Why a podcast? DUCKWORTH: So I think it’s the case that people like these things that they’re listening to where they get to actually talk to people like Stephen Dubner, and I thought, maybe there are a lot of parents out there and teachers who would like to talk to me about the science of how kids grow up to thrive. DUBNER: And lastly, a family grit question: Can you give an example of something particularly un-gritty that someone in your family has done? DUCKWORTH: Well, okay, a certain person would like throw themselves into various projects like metal detecting and then like stamp collecting, and then vending machines, and weight lifting, and like one thing after the other. And when you do that, then you’re not being gritty. DUBNER: I didn’t know vending machine was a hobby. DUCKWORTH: It can be. Short lived, it turns out, in this case. DUBNER: Angela Duckworth, ladies and gentlemen. Thank you so much. It is time now to get back to our game. Would you please welcome our next guest, Philip Barden. Philip is a professor of evolutionary biology at the New Jersey Institute of Technology, as well as a research associate at the American Museum of Natural History. So that sounds very promising. What do you have for us, Philip? Philip BARDEN: So, what does a hell ant and an iPod have in common? DUBNER: May we in turn ask you what the hell is a hell ant? BARDEN: Yeah, well, that’s a whole — okay, so that’s a decent question. So I work on fossil ants. That’s my niche. This is about as myopic as you might think you could get. Turns out there are as many fossil ant species as there are fossil dinosaur species. BARDEN: And among the oldest fossils that we know about, about 100 million years old, trapped in amber, are these ants called hell ants. And they have all these bizarre adaptations that we don’t see in any modern ants and in fact no modern insect. So what we see is these big scythe-like mandibles that jut out of the face and come up towards the forehead. DUBNER: A mandible is a jaw? BARDEN: The jaw, yeah, exactly, the jaw, the mouthparts. Modern ants have mouthparts that articulate horizontally. So if you take your arms and you kind of go to hug somebody, it’s sort of like that. This would be if you took and put your elbows together and you kind of went to jut yourself in the forehead with the tips of your fingers. Those are hell ants, right? Hell ants, it turns out, Dlussky, who’s this Russian paleo entomologist, named the genus for the first time in the 90’s, Haidomyrmex — haido meaning Hades, and myrmex, which is Greek for ant. And the common name is hell ants. DUCKWORTH: Why hell ants? Other than, it was good branding. BARDEN: It was just real spooky cool, just badass thing to name an ant. DUCKWORTH: Oh, it was branding. It was just a badass name for a species of ant. BARDEN: Exactly. Yeah, hado-myrmex, it just sounds — really truly, I mean, there are 13,000 species of modern ants, and this is the — it sort of breaks the mold. BARDEN: —have in common. I should say one other thing, which is that there are some hell ants that also have horns that come out of their forehead. We named one last year — we named it after Vlad the Impaler. And the reason is this: we C.T. scanned it, we looked through X-ray imaging, and found that these ants actually looked like they sequester metals into the middle of this paddle. What we think is happening is to prevent themselves from running themselves through their own forehead, they’re actually capturing prey and puncturing them and drinking their hemolymph, which is insect blood. So that’s why we named it after Vlad the Impaler. DUBNER: Were they the size roughly of modern ants? BARDEN: They were about a centimeter — so like your pinky. DUBNER: So how is it possible that an ant that tough didn’t make it? BARDEN: Well this gets into the thing — I’ll just give it to you. DUBNER: Give it to me. BARDEN: So, one of the reasons why we think that hell ants went extinct is potentially because — and they are extinct, and all their close relatives are extinct — because they are too specialized. They effectively painted themselves into a corner. some of the evidence that we have strongly suggests that they specialized on prey that also went extinct. This is an interesting thing in evolution, right, where we get into these scenarios where your adaptations work really, really well until all of a sudden the bottom drops out and they don’t. And they actually persisted for about 21 million years. We know about them from amber in Myanmar, France, and Canada. DUBNER: So what they have in common with the iPod is, they were too specialized and we don’t need them anymore. BARDEN: Perfect, nobody buys iPods anymore. DUBNER: Okay, so they’re a species that went extinct because, you’re arguing, of overspecialization, they were tough. There were certain prey that they could beat up, but otherwise they weren’t whatever, good enough to go on. But what about — aren’t there like — what good is the platypus for? Is that not a specialized thing and why is it still around? BARDEN: Well, so anything that is around today, it’s working, right? We always think about evolution as being this sort of game of winners and being the best or whatever, and it’s really just the best in that moment in time, in that particular slice. Right? So everything, including humans today. Right? If you put two humans two billion years ago, there is no oxygen in the atmosphere, game over, it’s hard. And in fact something like oxygen turns out to be another thing that sort of changed the game. So the earliest life on our planet — oxygen was catastrophic for it. There was no oxygen in the atmosphere. And then we start to get photosynthesis. All of a sudden having that adaptation of being anaerobic, that is, surviving without oxygen, becomes really terrible. And now we have this big massive extinction event because of something like oxygen. Now of course we all love oxygen. But it turns out that wasn’t really the case in the beginning. DUCKWORTH: So let me ask you a human-centric question. BARDEN: I don’t think about humans. DUCKWORTH: So are we over-specialized or are humans the opposite? Because we can learn anything. DUCKWORTH: Because you study ants. BARDEN: Because I study ants, and they are my comfort zone. But really, they are tremendously successful, and in many places they outweigh the biomass of all vertebrates, including humans, in some environments. And the most successful ants are also generalists, right, so they can capitalize all kinds of resources. They don’t rely just on one particular food source. And humans are very much the same way, although we have some other kind of funny things going on, this culture thing. And the ability to rapidly pivot. DUBNER: Aren’t modern ants said to be quite social? BARDEN: They are, they’re all eusocial, exactly. Yes. DUBNER: And do you think that part of the hell ant’s problem was a lack of some kind of socialization? BARDEN: This is a great question. So, we thought about this. We really thought that maybe it was that the earliest ants really weren’t social, and they were actually out-competed by their highly communistic counterparts who are alive today. And in fact, what we’ve found is that that’s not the case — the earliest ants, including hell ants, are highly social. There’s no such thing as a solitary ant. All 13,000 species today and all 700 fossil species so far as we know all were social. So, for example, if you look at all the different amber deposits in Earth history, starting at 100 million years ago, ants never make up more than one percent of all insects in amber, and yet we find many aggregations of them together. We calculated on the back of a napkin — we’re not mathematicians — but we figure that it’s something like one in a trillion. The idea of finding 20 worker ants in one piece, when you have less than one percent abundance. DUBNER: Are high or low income ants more likely to buy lottery tickets? BARDEN: There should be an ant lotto. DUBNER: Let me ask you this. Will science and technology allow you to bring back the hell ant? And if so, whose picnic would you send it to? BARDEN: Oh, this is a great question. So, not biologically, no. But, in fact, where I am now, we have some great industrial design students — we have C.T. scanned these and we’re now modeling them, we’re digitally bringing them back to life to figure out how the mechanics of these would work. BARDEN: Yeah, this is a great tee-up, by the way, for N.J.I.T., where I work now, and I do not have tenure, and I’d like to have tenure. And we’re also printing and constructing giant molds that are motorized, so we can use these for outreach, we’re taking them to schools and museums, potentially for museum exhibits also, because we really don’t think about insects as part of the fossil record, but they are. Today, 75 percent of all species that exist are insects. DUBNER: Mike Maughan, Philip Barden has been telling us about the extinct hell ant. What do you have to add? MAUGHAN: So I think a lot of people here misunderstood — when you say hell ant, we all think about our aunt from hell who is always trying to set us up. DUCKWORTH: That’s just your aunt from hell. MAUGHAN: So ants have lost a lot of things over the years — they lost the Impaler. They don’t have lungs, they don’t have ears, they can’t swim. They do have two stomachs. It’s interesting to see though that ants have lost a number of things, we as a culture of lost many things, some good, some bad, we’ve lost answering machines, pagers, Velcro wallets. We no longer have decent politicians. We’ve lost MySpace, which was a terrible tragedy. And if you haven’t yet lost Nickelback, do yourself a favor. DUBNER: Thank you Mike. And Philip Barden, thank you so much for playing Tell Me Something I Don’t Know. Would you please welcome our final guest of the evening, Livan Grijalva. Livan works in data analytics here in New York. He is a memory athlete, and currently holds the title of fifth best memory in the United States. I would like to apologize to our audience that we could only get the fifth-best memory athlete in America. But Livan, that sounds awesome and I can’t wait to hear what you have to tell us, so the floor is yours. GRIJALVA: So, have you ever been sitting in your living room on the couch and you remember that you need to get something from the kitchen? You get up, you walk to the kitchen, and as soon as you get there, you just completely forget what it is. So my question is, why does walking from one room to another cause you to forget? DUCKWORTH: Because you are — like place memory, right? You are activating the memory representation in one place and that has all these cues, and then you go to another place and those cues are absent? GRIJALVA: That’s basically it. So it’s something called the doorway effect. DUCKWORTH: Sorry, I’m a psychology professor. DUBNER: No, that’s really good. GRIJALVA: What happens is, when you’re sitting on your couch, you are thinking of something and you inadvertently, maybe you’re looking at the T.V. or you’re looking at the shelf and that idea somehow gets tethered to that location. So as soon as you walk to the next room, when you’re no longer looking at that, you seem to have forgotten what that is. And what happens is, as soon as you sit back down on your couch, it just comes right back to you, which is actually what memory athletes do in a way. We use a technique called the Memory Palace, where we place information that we want to memorize in specific locations in different rooms, and then we’re able to recall them later on like that. DUBNER: And you said it’s called the doorway effect? DUBNER: Meaning you pass through and you lose it. Hey, can I just ask you, my thought before Angela figured it right out was, I thought of something I think it was Arthur Conan Doyle once said about how the memory is like an attic, and if you fill it up with junk, then when you have something valuable to put in it, you don’t have room. And what it made me think of is, if you walk into another room, you’re just hit with all the new stimuli there, and they somehow hurt your being able to summon the memory because there’s only so much RAM that we all have going on. That’s not an issue? GRIJALVA: Actually, I love Sherlock Holmes, so I know that quote really well, and what I thought was really interesting was that he’s saying that your brain has a limited amount of space, which believe it or not, I mean, as far as these memory athletes are concerned, we can pretty much memorize large, large amounts of information. I don’t think anybody — if there’s any scientific studies that show that there is a limit — like, this person has hit the limit of it all they can memorize. So, while it’s sort of true, I don’t know if that’s exactly it. DUBNER: Just a side observation: you say the phrase “memory athlete” as if we think that is athletic. DUCKWORTH: Takes training, right? Takes practice. DUBNER: I’m not saying it’s not, but I’m curious, was that said originally in jest and it got real? GRIJALVA: No, that’s a very good question. Mnemonist is another name for it, but I guess, yeah, we just call ourselves memory athletes or mental athletes. DUCKWORTH: So I want to know more about this thing that you do — so can you give me some examples of things that you’ve memorized or competitions that you’ve been in? GRIJALVA: Sure. So there’s lots of competitions all over the world every year. And basically people like myself get together and they try to memorize as much information in the shortest amount of time possible. So some of the events are, let’s say, memorizing hundreds of random digits, binary digits, names and faces, abstract images, lines of poetry. And one of my particularly favorite events is basically memorizing the order of a shuffled deck of cards in under five minutes if possible. So it’s basically after all these events, scores are tallied up and then you get a champion. DUBNER: So you’re obviously very good at this. I’m curious, do your fellow competitors — do you all pretty much use the same methods? GRIJALVA: They pretty much do. As I was mentioning before, the memory palace is the main technique that we use, which is an ancient Greek technique where you basically construct places in your mind. So at a smaller level, you might imagine your apartment as a memory palace. You might imagine your front door as a location No. 1, and you walk through and your living room would be location No. 2. Your kitchen could be location No. 3, the bathroom No. 4, and finally your bedroom, No. 5. So what you’ve done is, you’ve created a mini journey that you can close your eyes and walk through it. So on a much larger scale, this is what memory athletes do. We just have hundreds and hundreds of palaces and different ones, yeah. DUCKWORTH: Are they real, or are they imagined palaces? GRIJALVA: So they can be either one. I tend to like to use real locations. I just came back from Ecuador. So on my trip, I tried to stop in a few different museums and stuff like that and try to build memory palaces along the way. But I also used to play a lot of video games, first-person shooters, so I would actually take the environments in the game and also turn those into memory palaces. Basically anything that you can imagine yourself in. It’s so much easier though if it’s real places — like humans are really good at navigation. So it’s pretty easy to build palaces wherever you go. DUBNER: So you actually go to new places in order to create memory palaces from them afterwards, yes? GRIJALVA: Yeah. And usually I will take notes or take photographs of different places. It makes it so much fun too, because you could actually close your eyes and be in these places. A lot of times when I’m memorizing in competitions, it’s so strange but also really relaxing to be able to walk through all these places in your mind. DUCKWORTH: So why do you do this? I actually admire this. Very gritty. But what do you get out of it? And do you think you’ll still be doing this 10 or 20 years from now? GRIJALVA: So I originally was a magician, so I would do a lot of stuff with cards. And obviously as magicians we pretend to memorize a deck of cards to do tricks, but then I found out people were actually memorizing them, and I thought to myself, “Well, as a magician, as somebody who loves cards, I have to be able to do this.” So I started training myself to just do that. But it turned out it was so much fun to actually be able to do this. Just being able to achieve faster speeds. The first time I ever memorized a deck of cards for a magic trick, it took me three hours. Now it takes me 32 seconds. I mean, the sheer amount that you can cut down is just so interesting. And even four years into competing, I’m still finding that there’s things about the brain and how memory works that I didn’t know before. 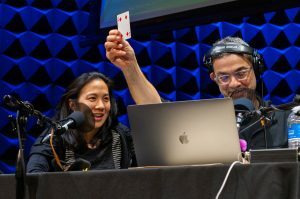 DUBNER: Can you just give us an example of, let’s say, a deck of cards memorizing. And obviously you don’t have them — or do you have a deck of cards on you, by chance? GRIJALVA: I do. So I can give an example, because unfortunately, seeing a memory competition is not that exciting. It’s just a bunch of people sitting there with headphones and dead silence as they run through. DUBNER: So just imagine how exciting it will be to listen to people seeing a memory competition. GRIJALVA: So basically what it is is, the technique — I already mentioned the memory palace. In my mind I have a location that I’m set to go when I want to memorize. Cards are abstract. It’s hard for you to remember them because they have no real meaning. So what we do is, we turn every card into somebody or into something that’s more meaningful. So in the technique that I use, I’ve turned every card into a person and an action associated with it. So let’s say the 10 of hearts is Homer Simpson. GRIJALVA: So originally — this is the hard part. Building the system requires things — you have to sort of make it up. Like here’s an easy one. So the six of hearts is Michael Jordan, and that one makes sense because Michael Jordan won six championships, and I say he’s got a lot of heart. So it’s very easy for me to memorize that. The ace of spades is James Bond, and I think of the highest card in the deck as being James Bond when he plays poker. So, some of them are easy to associate. DUBNER: Okay, so each memory athlete creates their own mnemonic for each card. Correct? GRIJALVA: Yeah. There is a slight variation. So my system, like I was saying, uses two cards. So let’s imagine that — I mentioned that the ace of spades is James Bond and the 10 of hearts is Homer Simpson. So if I was memorizing — if the cards were in that sequence, let’s say ace of spades, 10 of hearts, I would take my first location. Let’s imagine the front door. And I would take the first card, the ace of spades, and imagine James Bond standing at the front door. But the second card is the 10 of hearts, Homer Simpson. But it also gets confusing because later on, when I’m remembering it, I’m like wait a minute. Was it James Bond and Homer Simpson, or Homer Simpson and James Bond? So what we do is, we modify the technique to create a hierarchy. So the first card is the person. The second card would be an action. So it would be James Bond drooling, which is an action that Homer Simpson does. So if it was the other way around, if was 10 of hearts, ace of spades, it would be Homer Simpson drinking a martini. DUBNER: And you do all that for 52 cards in how many seconds? GRIJALVA: So my current competition best is 34 seconds. My personal best is 32 seconds. DUBNER: What do you think you can do right now? GRIJALVA: I’m not sure, I’m a little bit out of practice. DUBNER: Do we shuffle them? DUCKWORTH: I feel like we should shuffle them. GRIJALVA: So we’ll do about half the deck, only because regurgitating 52 cards might be a little boring. I’m going to try to go through a few of them and see what we get. DUBNER: Angela, should we narrate a little bit? It’s very dramatic. There’s a man on stage looking at cards. MAUGHAN: You’re making this so hard for him. GRIJALVA: So you can verify that I got them right. So first, I’ll say the cards and I’ll say what I’m looking at. So the first card should be the nine of spades, which would be a girl that I know named Lily. The second card should be the seven of spades, which would be a samurai sword. Then it’s the ace of hearts, which is Johann Sebastian Bach, with a nine of diamonds drinking tea, the next card would be the six of diamonds, which is a friend of mine called Six, who is freezing, so it should be the five of hearts. Then it’s Old Boy from the film Old Boys, so it should be the seven of diamonds, followed by the ace of clubs, which is hanging upside down. Then it should be the four of diamonds followed by the six of spades, I believe, then the queen of spades, six of clubs, nine of hearts, five of clubs, eight of hearts, two of hearts, 10 of — Homer Simpson, so it should be the 10 of hearts, doing yoga, which is Queen of Diamonds, followed by Clint Eastwood spray painting, so it should be ace of diamonds, four of hearts, followed by Sharon with sheep. So it’s three of spades, jack of hearts, followed by — this is Reggie Miller doing — so it’s the king of spades. Is he eating spinach? Five of spades? Jack of spades, five of spades. Is that all? DUBNER: So, that was remarkable. I’ve read about people who do exactly this, and it’s impressive, obviously, when you read it. But that was absolutely remarkable. Thanks for doing it for us. DUCKWORTH: Can I ask you this: which is more important to you, beating the four memory athletes who are ranked higher than you, or beating yourself? GRIJALVA: I’ve actually — when I first started I didn’t know any of the memory athletes. So I thought to myself, I’m going to come in and I’m going to try to beat everybody. Because at the time, the U.S. wasn’t very well ranked among the world. Like the top countries were, I think, China and Germany. But by coincidence, the same time that I started competing, two other friends of mine — now they’re friends, but two other athletes started competing as well, and they were so, so great that right now the No. 1 guy in the U.S. is also the No. 1 guy in the world. So the U.S. now holds the record for being the best country with a memory athlete as it were. DUCKWORTH: America is great again. DUBNER: I have a question for you, Livan. What does this phenomenon, the original phenomenon we were talking about, the doorway effect, or just the way you’ve learned to control memory or to build memory — what does this suggest for people with memory loss? Is there anything clinical-ish, therapeutic-ish that it suggests? GRIJALVA: Well, that’s kind of interesting because at the same time people make the joke a lot of times that I should never forget anything. And if anybody who knows me, knows that I have a pretty average memory when I don’t pay attention to things. The reality of it is that these techniques are so specialized that this is what I use for a deck of cards. I could practice this for hours and be really, really fast at a deck of cards. It won’t translate to being fast at numbers. I would have to specialize and train just at numbers. I teach a class, and what I try to tell people is basically, you practice these things and when you understand them, you’re able to use them in your day-to-day life. So it’s a really great way to kind of stay in shape, but unfortunately these techniques are very, very specialized for what it is that you want use. There’s no magic key that if you practice this it will improve your general memory. DUBNER: Mike Maughan, Livan Grijalva has not only showed us how to memorize part of a deck of cards, but told us a lot about memory and memory athletes. Care to tell us if everything checks out? MAUGHAN: So for years, golfers and cheerleaders have been mocked mercilessly for calling themselves athletes. You’ve just handed them an amazing gift. A couple of substantive things: we learned from Colin Camerer on this podcast a while back that one of the keys to memory is curiosity, because it enhances the encoding process, which is one of the three stages of memory, which are encoding, storage, and recall. So this idea that we’ve talked about of the Doorway Effect happens when we change locations, and therefore remove triggers that help us in the recall stage. So it’s encouraging to know that we’re not crazy when we walk out of a room and forget what we were doing. Interestingly, like all things in life, it turns out that to increase your memory function, you’re supposed to get sleep, exercise, and eat a healthy diet. So in other words, it’s probably not worth doing what it takes to improve your memory. DUBNER: Mike, thank you. And Livan, thank you so much for playing Tell Me Something I Don’t Know. And can we give one more hand to all our guests tonight? I thought they were fantastic. Thank you. It is time now for our live audience to pick a winner. Tough one, so good tonight. Would you please take out your phones and follow the texting instructions on the screen. So who will it be? Ben Orlin, who told us about lottery misperceptions. Kate Sicchio, using choreography training to spy on people. Philip Barden, the unfortunately over-specialized hell ant. Or Livan Grijalva, with memory and the Doorway Effect. Tell Me Something I Don’t Know and Freakonomics Radio are produced by Stitcher and Dubner Productions. This episode was produced by Alison Craiglow, Harry Huggins, Zack Lapinski, Morgan Levey, Emma Morgenstern, Dan Dzula, and David Herman, who also composed our theme music. The Freakonomics Radio staff also includes Greg Rippin and Alvin Melathe. Thanks to our good friends at Qualtrics, whose online survey software is so helpful in putting on this show, and to Joe’s Pub at the Public Theater for hosting us. The post Freakonomics Radio Live: “Jesus Could Have Been a Pigeon.” appeared first on Freakonomics. Anna De Suza is a self-taught Finance Expert. She writes financial tips and articles related to money and investments.